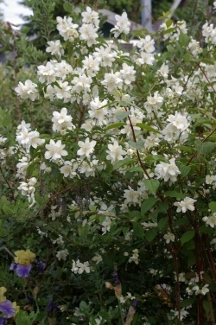 Joy Creek Photo Archive (c) all rights reserved Philadelphus lewisii 'Blizzard' is a Canadian selection of our northwest native Mock orange that is said to be more winter hardy and more free flowering than the species. Some say it is also more compact but it has attained six feet in our garden. It is densely shrubby in habit with attractive red brown new stems. The name 'Blizzard' is a good description of the flurry of single flowers that open over serveral weeks. This selection is indeed fragrant. Late spring to early summer. 5-6 ft. x 5-6 ft.